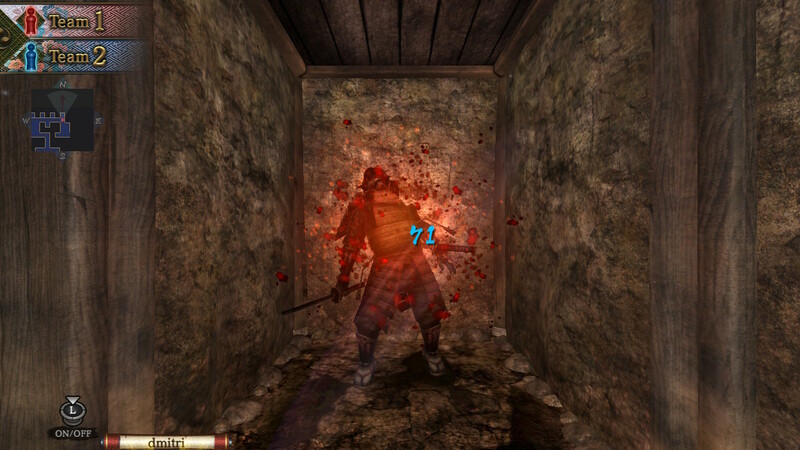 We’ve encountered the rundown castle of Hyakki once before when the PC version was released, and the overall consensus was that we liked the concept and the game itself. This time however, we get spooked on the Nintendo Switch, with the port of Hyakki Castle, simply with an altered name, namely Haunted Dungeons: Hyakki Castle. The original game already had an eerie vibe, but the new title will certainly hold no surprises for unsuspecting gamers who come across this title and add it to their libraries. Long ago in the mid-17th century in Japan they have unified the nation and formed the Tokugawa Shogunate, the era of rampant war was fading away in the back of their minds until the council of elders was brutally assassinated. When their leader was at risk, the violence was stopped in a desperate attempt by their sorcerer. Since then, ten years have passed. At one specific day a package of unknown origin had arrived at Edo Castle with a letter attached to it which read, “Gifts: Three Heads, Hyakki Castle Lord – Kigata Doman”. Inside the package were the heads of three men, one from a Hyakki guard and two heads of random criminals. Rumors reached the Tokugawa Shogunate that a mysterious castle has appeared on Hyakki Island, the island where Kigata Doman was exiled. Obviously the leader of the Shogunate felt the treat they were facing and gathered a group of people that were specialized in the supernatural to defeat Doman. The four warriors were granted a magic tool “Ishin no Ofuda”, with this they could split themselves into two groups, with the non active party turning to stone. As dangerous as it may have sounded he trusted his warriors to use it effectively. The flow of the story is fairly quick because that most of it is told in the first minute of your game. It creates that same eerie mood as the sound and the graphics do. 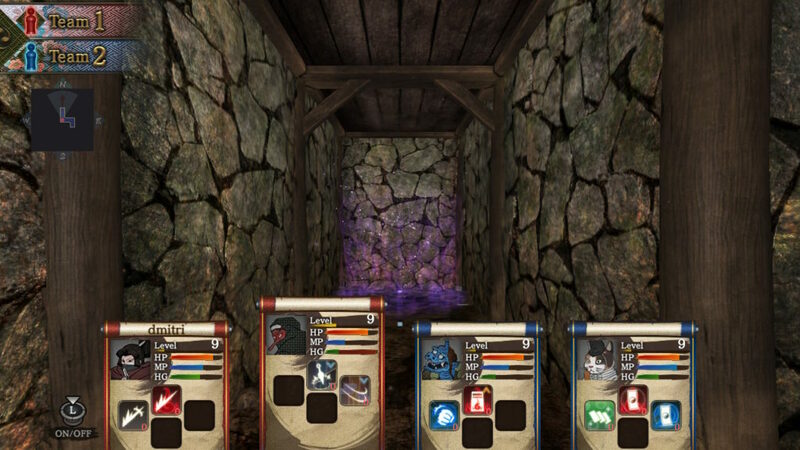 Overall an old school dungeon crawler doesn’t need more background than this in our opinion. Graphically speaking, Hyakki Castle isn’t the best looking game around. While the game has its charm, and the monster designs are certainly creepy and fairly well executed, all of it feels a bit dated, especially when you look how empty the halls of the actual dungeons are. The game could have used a few extra textures, a few variations between the same type of monsters, or some extra clutter to make a living and breathing dungeon. Those sentiments aside, for a budget priced game, the developers still did a fairly good job. The developers surely know how to make you scared beyond imagination. The eerie winds blow through the crooked halls of the dungeons. The growls and scoffs of monstrous opponents will make you want to turn the lights on and every crack or sound you hear from broken vases, bumping into walls or levers you pull; only add to the immersion of the sound. Don’t hope for any other sounds, because there are non, only ear deafening silence. 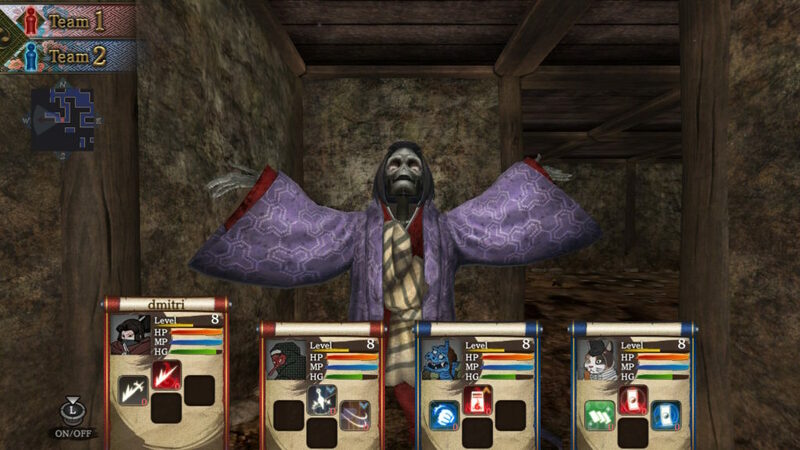 Haunted Dungeons: Hyakki Castle is an old school dungeon crawler RPG which is played in the first-person mode. At the beginning of this game they just throw you into the deep. You’ll get all of the explanation in the first few hallways and it makes it hard to grasp if you start off the game for the first time. Nevertheless when you get the hang of the purpose of each move, item or skill, they are easy to understand. You play in a group of four warriors who can only move one tile a time. This is common by most old school dungeon crawlers but it makes your movement options fairly limited. You can split your team in half with your “Ishin no Ofuda” tool. With this you can simply carry out tasks which are meant for more than one person. Most of the hallways and rooms are empty or filled with treasure chests or vases. Those can be smashed or opened for retrieving the loot inside. Other halls or rooms are filled with one or more monstrous opponents, which you need to overcome if you want to progress. 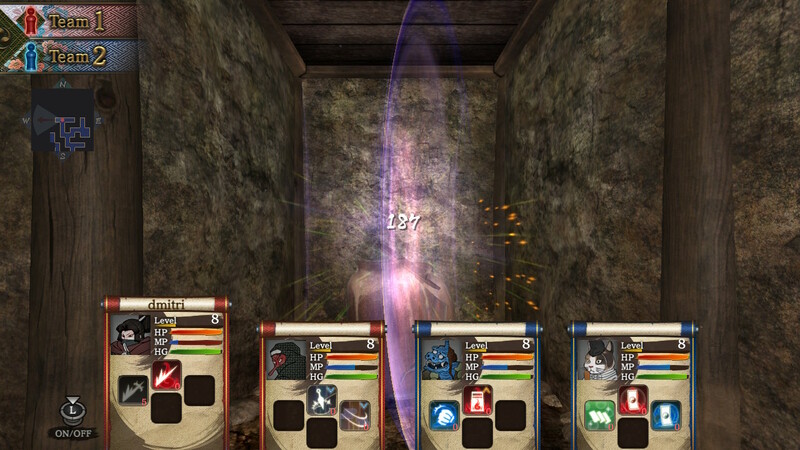 The dungeon has also a lot of doors with needs to be opened in a certain way. Most of the doors can be opened by killing the monster in front of it or just pulling the lever attached to one of the nearest walls. Others need to be opened by a little mini game, most of those need “Ishin no Ofuda”. When you want to save there are several spots on each floor where it is possible to do that and to gain back HP. The combat and gearing are quite simple in this game and straightforward. Each character has three gear slots and a handful of abilities which use up MP. Your MP can be regenerated by certain types of food and also your hunger will need to be satisfied once in a while. If you need to recover your fellow teammates or HP, you need to rest at a save spot on the pillow one of you possesses. Keep in mind only the living can use the pillow. Haunted Dungeons: Hyakki Castle is a fairly sturdy port of the original game, but in many ways the game will never reach the top charts of the Nintendo eShop. You’ll still have a fairly decent dungeon crawler on your hands, but even for those who are more into the typical JRPG versions, this game will not immediately stand out. Overall a decent game, but we weren’t really amazed by what this game had to offer. Nonetheless, if you’re looking for an old school dungeon crawler, with odd party mechanics, then this one might be fairly interesting and worth considering.